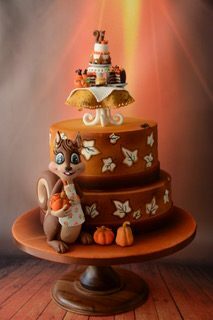 Learn how to make an Autumn squirrel cake with our FREE step by step tutorial from Anjali Tambde! 45Place the table on the top tier of the cake and glue with some royal icing, while the squirrel on the base, finish with a satin ribbon to cover the edges of the base. Try mixing some gel colours to get, new shades in your sugar paste,they can create great hues of the same colour. Use a craft tweezer to lift miniatures and try not to move them a lot before they are completely dry,I would generally place them on a small piece of strong foil and lift the foil itself without actually touching the miniatures,this prevents getting fingerprints on them too. Ready made cake or dummy cake. Each tier is iced in white,dowelled and stacked on the edge of the base to have room for the squirrel to stand. Want to learn tutorials like this via video? Join CakeFlix with a FREE trial and access over 800 multi-award winning cake tutorials NOW!